Sublime extra fine merino wool DK is made in Italy from the finest quality merino wool fibre. This luxuriously smooth and soft yarn has been created to give wonderfully clear stitch definition, the most exquisite detailing, the neatest stitches and a flawless finish to your hand knits. 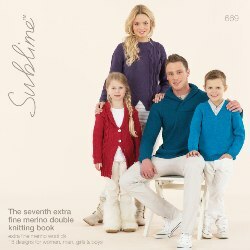 Sublime have designed a stylish and modern collection for women, men, girls and boys in the most inspirational colours including Indigo blue, Spruce teal, Gem turquoise and Black Cherry with splashes of bright Redcurrant and Sunday yellow, taken from Sublimes collection of luxurious colours.